Click a photo to see a larger view. Please send your comments and corrections to Steve. Camera-wielding railfans appear to outnumber people looking to board this MARC-53-led evening commuter train. 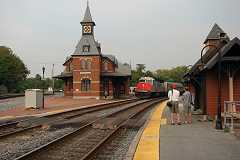 The small platform shack on right is a recent addition that blends nicely with the station's architecture. 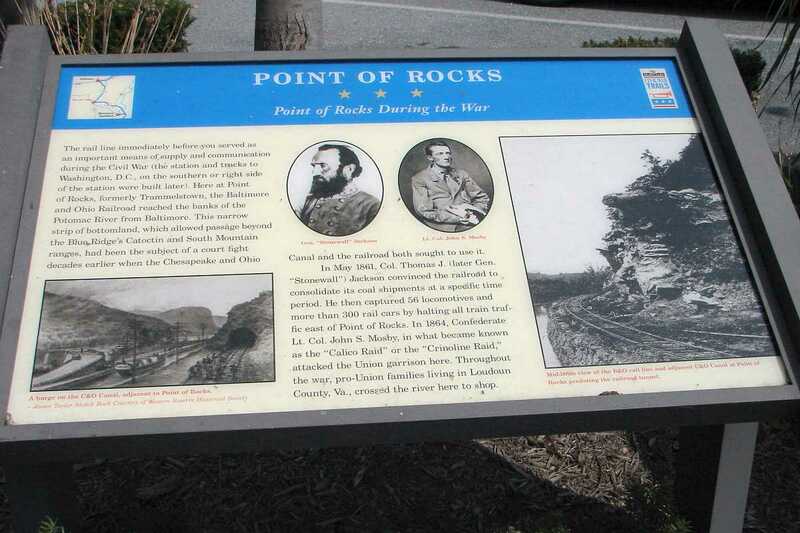 In the late 19th century and early 20th century Point of Rocks had been known as Washington Junction. Three milepost references make for a jumbled mess at Point of Rocks: 1) the current Old Main Line Subdivision (BAC), 2) the Metropolitan Subdivision (BA), 3) the original B&O Main Line west of Point of Rocks. BAC and BA are CSX's milepost prefixes. Warning: nitpicky railfan content ahead. The BA prefix begins counting in Washington, DC, and extends some 42.8 milepost miles to Point of Rocks where its mp number suddenly jumps so as to match the original Main Line's mps as the tracks continue west. The sign at the end of the platform attempts to explain, but instead adds to the confusion by mistakenly claiming BA 42.8 = BAC 68.4. In reality, this location is 0.7 miles west of BAC's milepost 64, thus making it BAC 64.7. By mentioning BAC, the sign implies westbound trains will be seeing BAC mileposts, but that's not true. 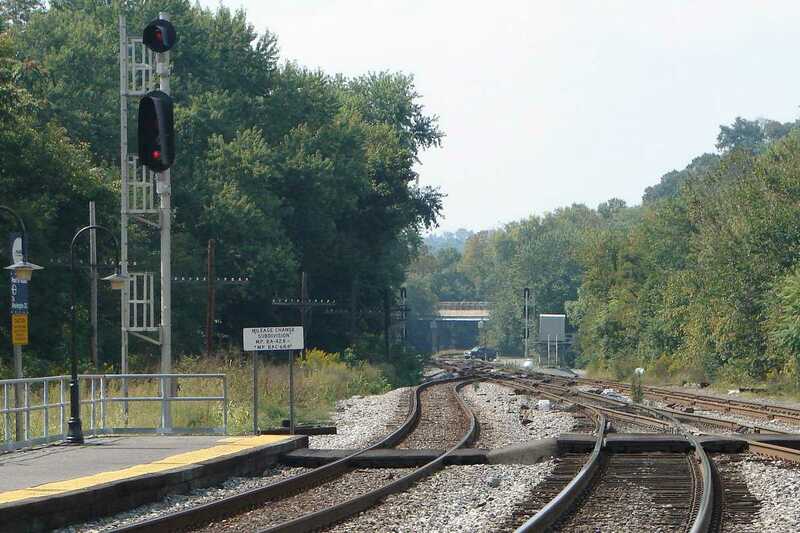 BAC is CSX's Old Main Line Subdivision whose eastern end point is in Baltimore, and western end point is at the signals 0.2 mp in the distance. The 68.4 value on the sign probably comes from the OML's original value prior to straightening efforts that reduced its length, however, that's the wrong number. The sign's location is about 0.3 miles east of BA mp 69. So, the sign would do better to read "BA mp 42.8 becomes BA mp 68.7". Though the track west from here was originally the B&O's Main Line from Baltimore, it became part of the Metropolitan Branch after the B&O opened that branch in 1873. 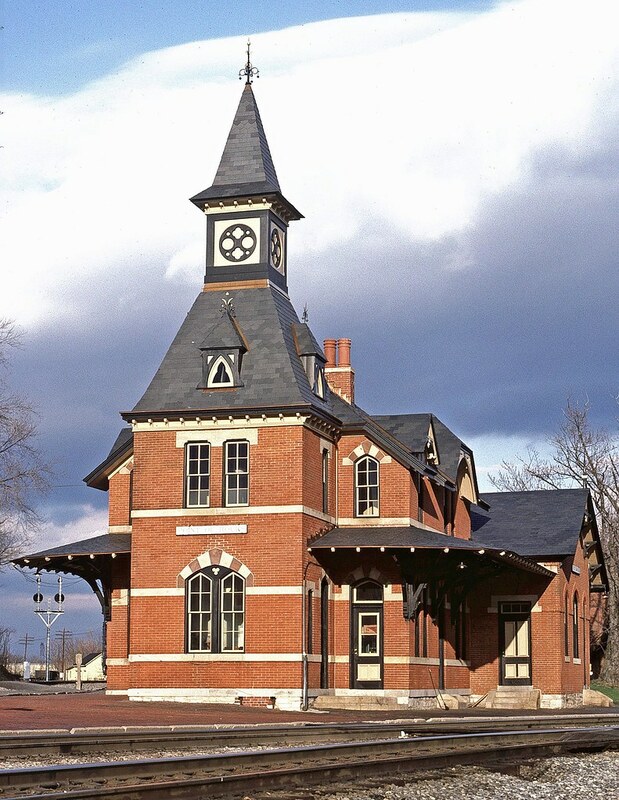 "The rail line immediately before you served as an important means of supply and communication during the Civil War (the station, and tracks to Washington, D.C., on the southern or right side of the station were built later). 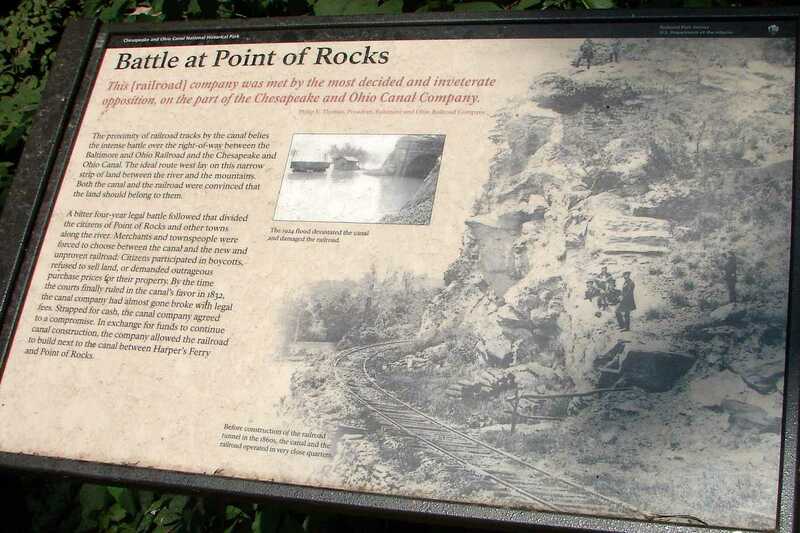 Here at Point of Rocks, formerly Trammelstown, the Baltimore and Ohio Railroad reached the banks of the Potomac River from Baltimore. 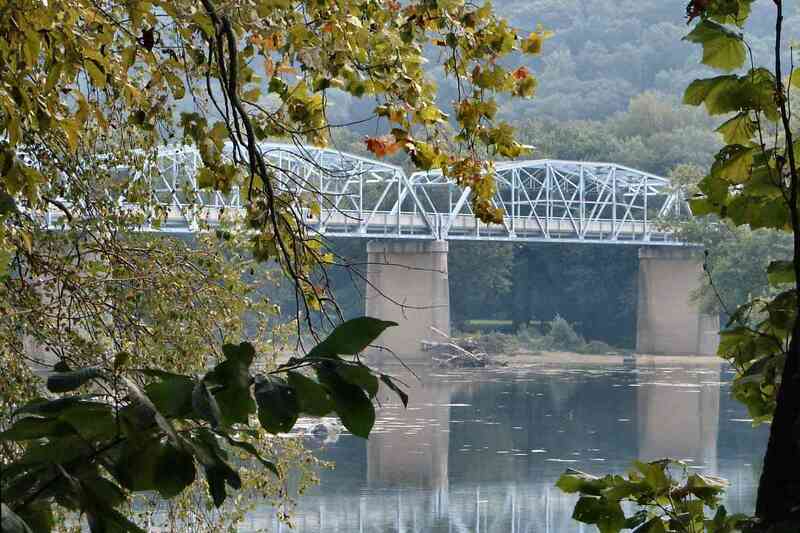 This narrow strip of bottomland, which allowed passage beyond the Blue Ridge's Catoctin and South Mountain ranges, had been the subject of a court fight decades earlier when the Chesapeake and Ohio Canal and the railroad sought to use it. "In May 1861, Col. Thomas J. 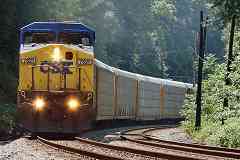 (later Gen. 'Stonewall') Jackson convinced the railroad to consolidate its coal shipments at a specific time period. He then captured 56 locomotives and more than 300 rail cars by halting all train traffic east of Point of Rocks. In 1864, Confederate Lt. Col. John S. Mosby, in what became known as the 'Calico Raid' or the 'Crinoline Raid', attacked the Union garrison here. Throughout the war, pro-Union families living in Loudoun County, Va., crossed the river here to shop." 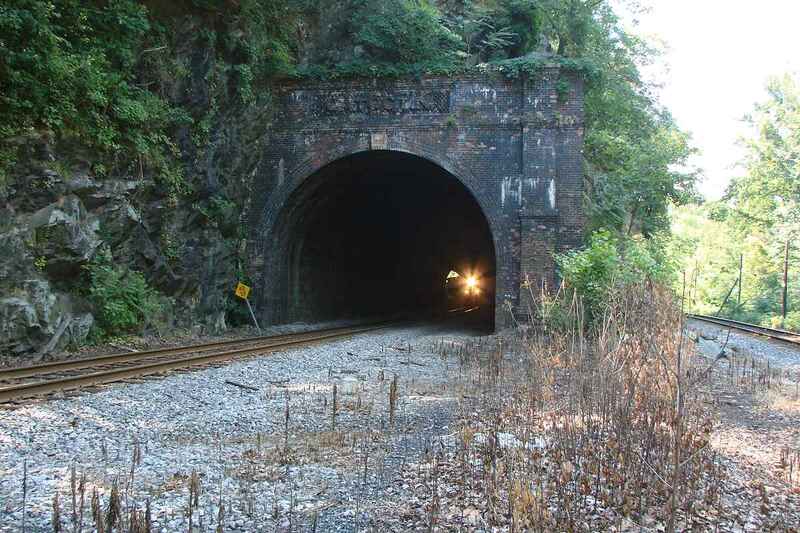 At US 15 we get our first glimpse of Point of Rocks Tunnel. 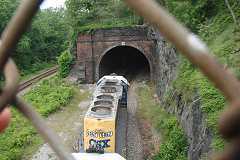 US 15 facilitates an overhead view of CSX 6062 about to enter the tunnel. 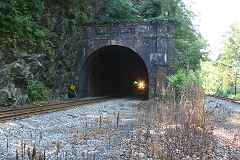 The tunnel opened in 1868, and was widened in 1902. 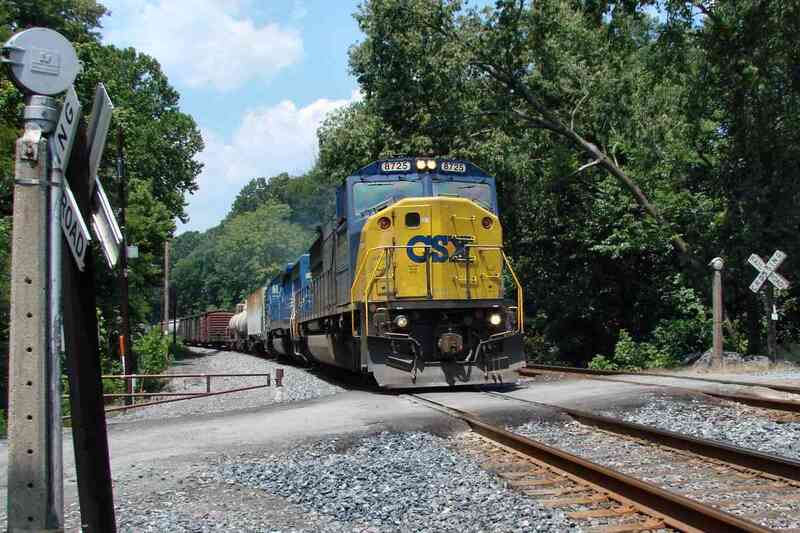 "The proximity of railroad tracks by the canal belies the intense battle over the right-of-way between the Baltimore and Ohio Railroad and the Chesapeake and Ohio Canal. The ideal route west lay on this narrow strip of land between the river and the mountains. Both the canal and the railroad were convinced that the land should belong to them. 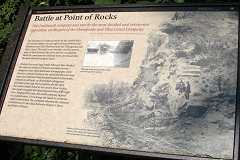 "A bitter four-year battle followed that divided the citizens of Point of Rocks and other towns along the river. Merchants and townspeople were forced to choose between the canal and the new and unproven railroad. Citizens participated in boycotts, refused to sell land, or demanded outrageous purchase prices for their property. By the time the courts finally ruled in the canal's favor in 1832, the canal company had almost gone broke with legal fees. Strapped for cash, the canal company agreed to a compromise. 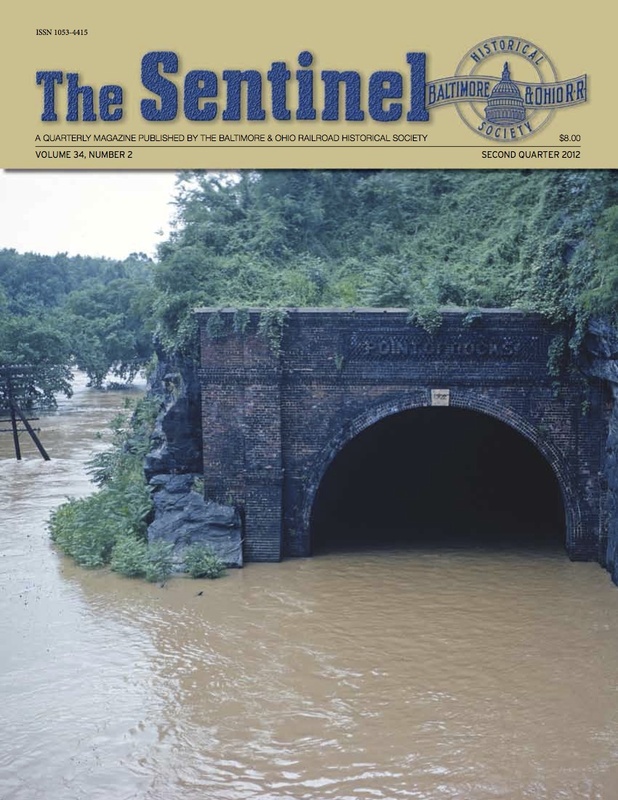 In exchange for funds to continue canal construction, the company allowed the railroad to build next to the canal between Harper's Ferry and Point of Rocks." J.M. 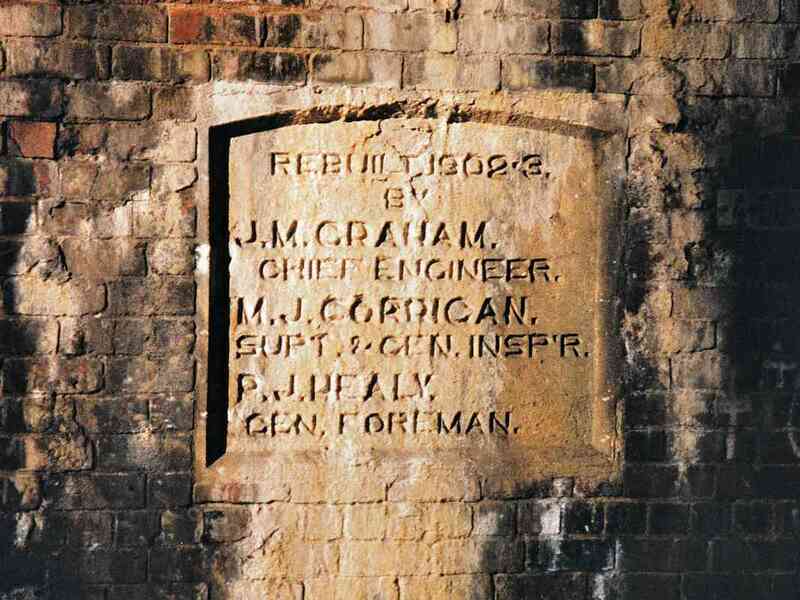 Graham and M.J. Corrigan worked on many/most/all the B&O's early 20th century tunnel upgrades between Baltimore and Harpers Ferry. 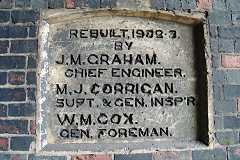 A similar plaque is in Henryton Tunnel. 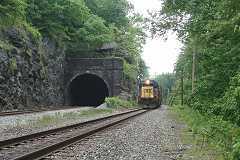 Westbound CSX 8634 scoots around the tunnel. In my opinion, this and the nearby Catoctin Tunnel were the B&O's most unnecessary. Prior to the tunnel, the B&O had carved a ledge with room for one track. 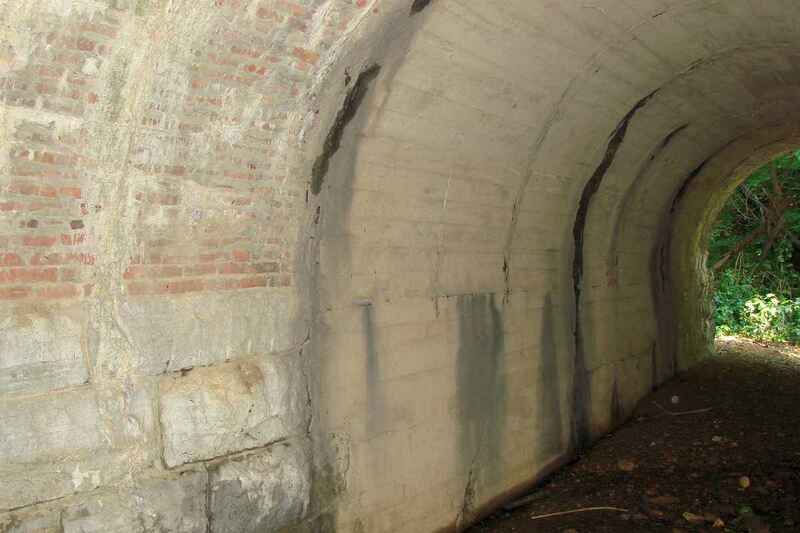 In 1867, rather than widen the ledge, it built a tunnel wide enough for two tracks! 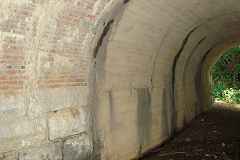 How this was justified is a mystery since surely a tunnel was more difficult and expensive work. 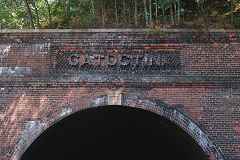 Then in 1902 the B&O spent even more to improve the tunnel with brick lining and portals. 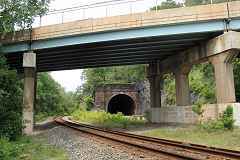 By the mid 20th century, taller rail cars meant the tunnel height was insufficient for double track, so one of the tracks was re-routed around, creating the bizarre configuration that persists. I suspect this arrangement found at Point of Rocks and Catoctin Tunnels of one track tunneled while the adjacent runs outside is rare. 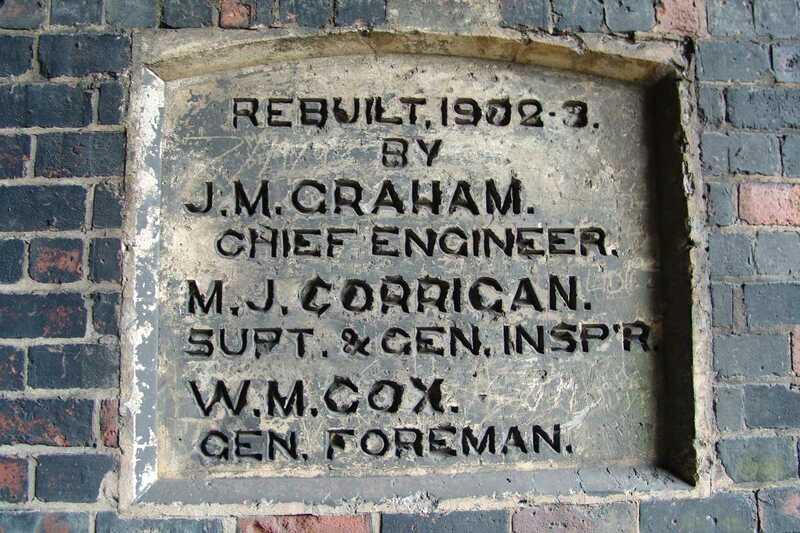 Anyone know of another location? Despite a fair population density northwest of Washington DC, few bridges span the Potomac River. This one that carries US 15 is the first upstream of the Washington I-495 Beltway crossing some 30 miles away. The C&O Canal was unable to compete with the B&O's speedier service, leaving it encumbered by debt. 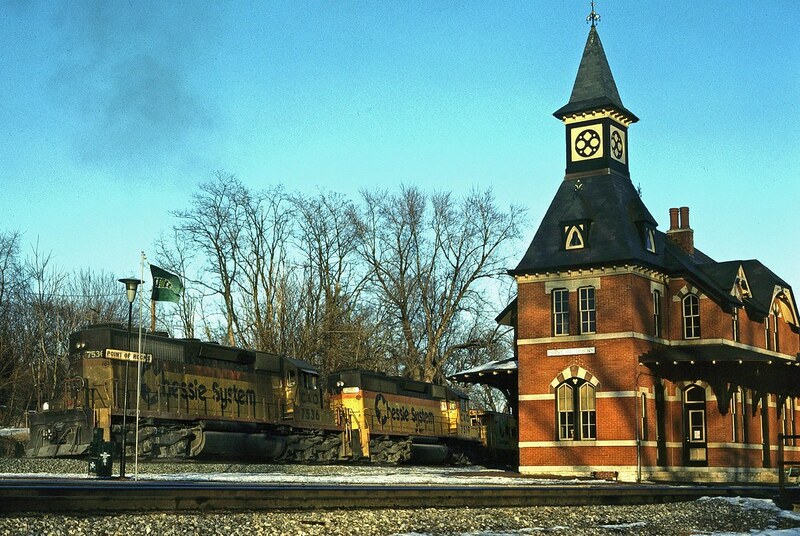 In the late 1800s the B&O purchased it, largely to keep it out of the hands of another railroad. 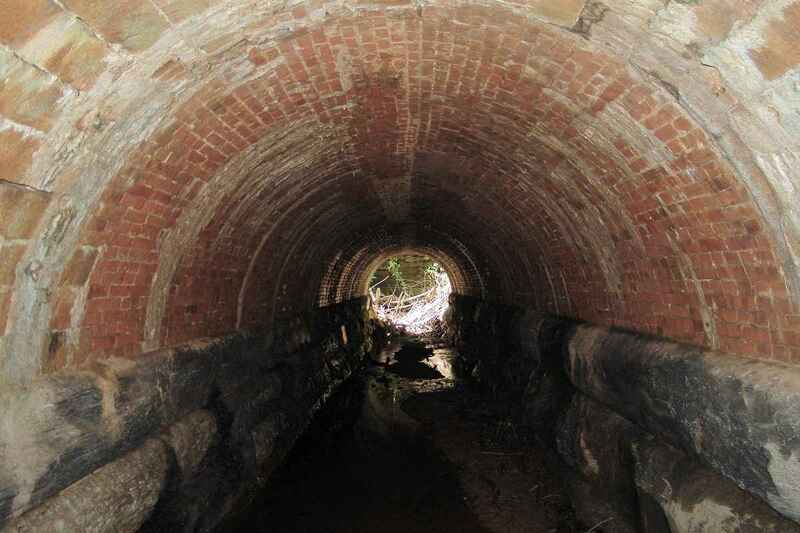 The B&O continued to operate the canal until a flood in 1924 damaged it beyond repair. In 1938 the B&O transferred it to the US Federal Government, who in 1971 named it a National Historical Park. The canal's towpath, seen here between the drained canal's stone wall and the house, is now a popular hiking and biking route. Many canal structures, such as this lock and house, survive to elucidate for the curious railfan engineering techiques contemporary with those of the adjacent B&O. 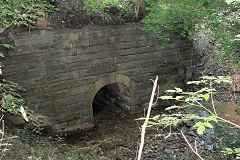 Details of the canal's almost-200 mile length are beyond the scope of this B&O site, but are covered well by other web sites. Since the canal needed employees available 24-hours a day to operate each lock, a lock keeper was given a house in which to reside. 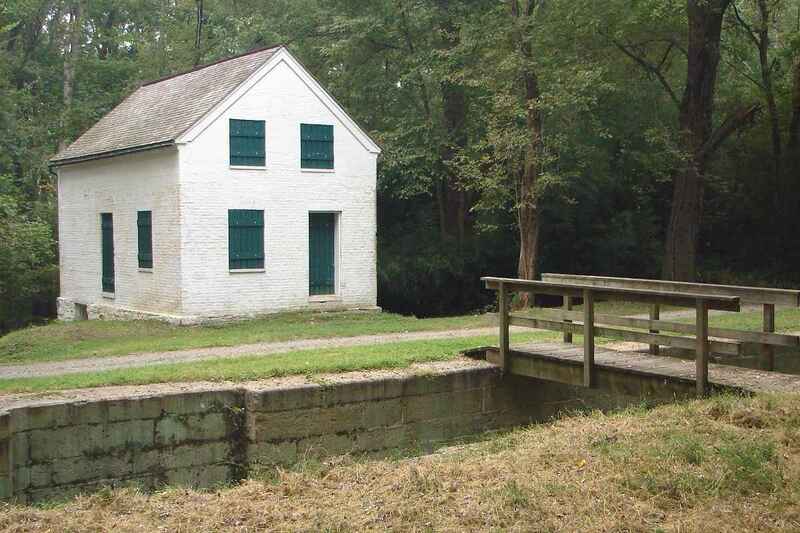 William Henry Fulton was the last keeper to live in the house at Lock 28; he and wife Emma raised 10 children here. 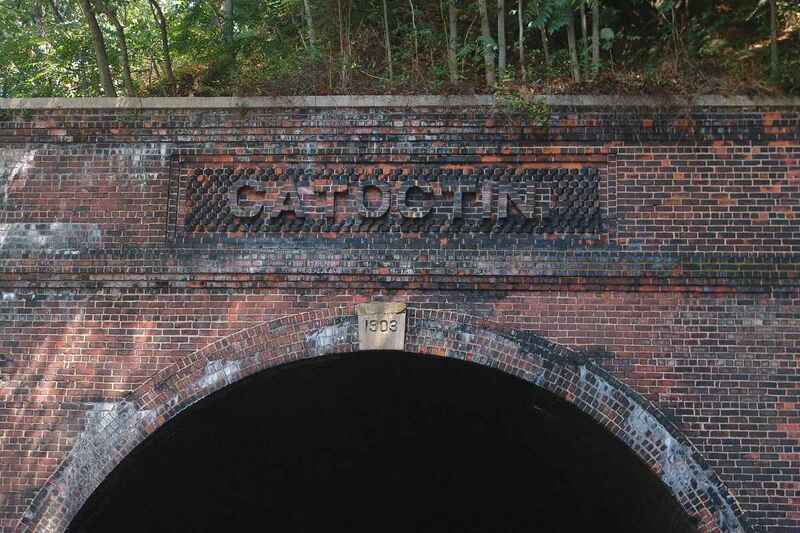 1903's Catoctin Tunnel gets the artistic "name-in-brick" touch also found at Henryton, Sykesville and Point of Rocks Tunnels. 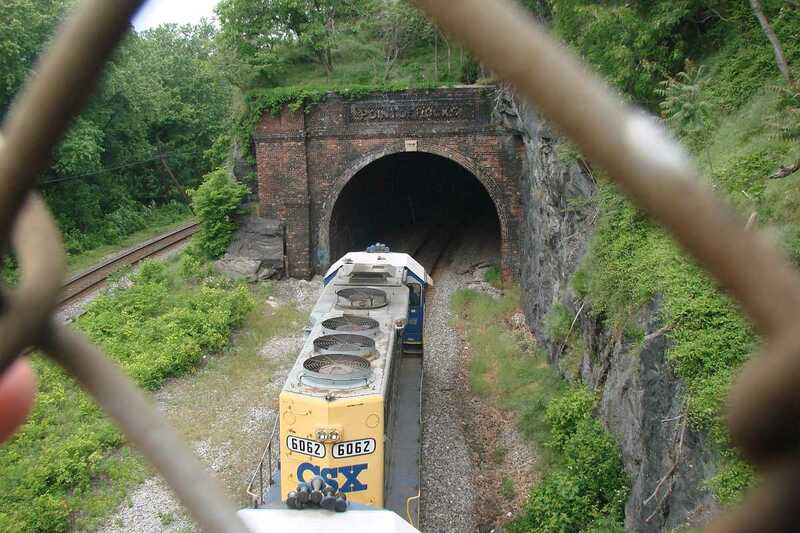 Sorry, I cannot resist describing this as the light at the end of the tunnel (CSX 533). DEER 708 has been signaled to Approach Slow. Insufficient culling of the herd has led to an explosion of the deer population in the Baltimore/DC suburbs. 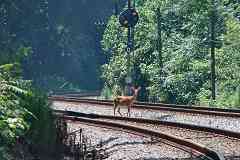 Train/deer and automobile/deer collisions are growing more common. Deer also carry ticks that aid the spread of Lyme disease. The Lander Branch qualifies for a fairly substantial structure. 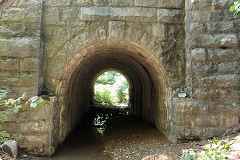 Its stone arch is tall enough for a person to comfortably walk under. This arch don't need no education. 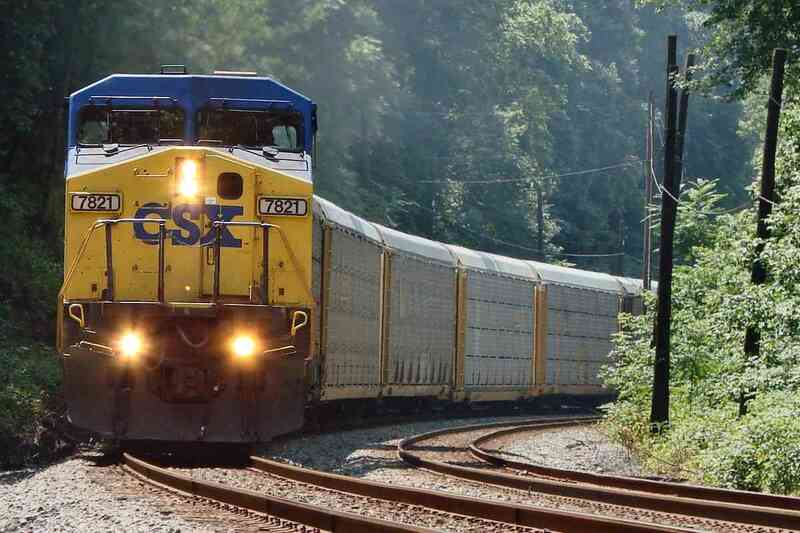 A midsummer, midday sun shines brightly high overhead CSX 7821 and autoracks. 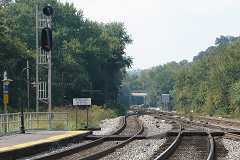 The quiet Lander Road grade crossing shows only warning signage and bells for CSX 8725. 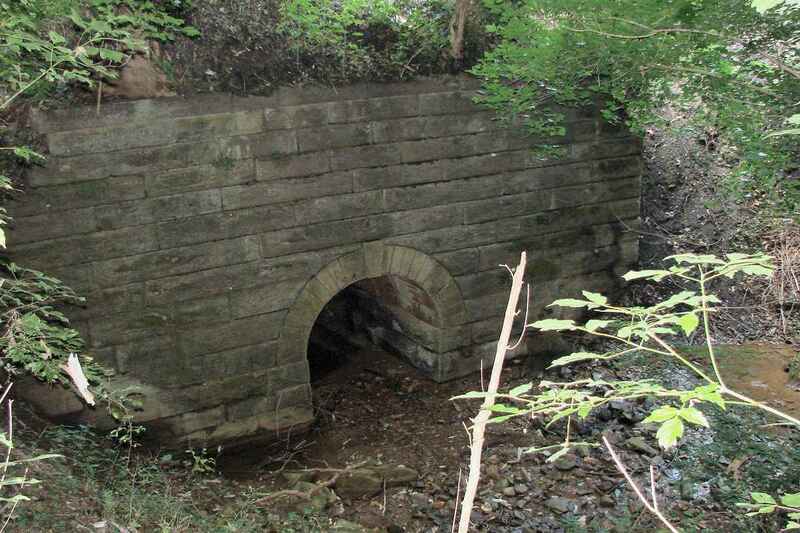 Just west of Lander Road a small, unnamed creek trickles under another substantial stone arched bridge. The differing construction styles reveal this bridge was widened by an addition on its south side as part of the B&O's extensive alignment upgrading efforts early in the 20th century. Or, return to main page for other tours.